Explaining to a wider audience how the history of transport and mobility has shaped present day, is a goal many of us share. One academic in Australia who has had significant success in this endeavour is Professor Robert Lee. 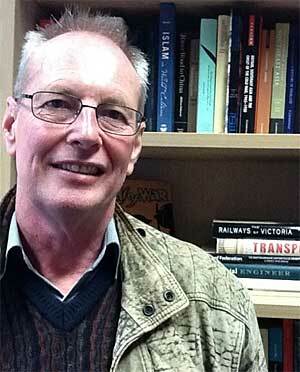 Robert has been teaching Australian and Asian History to students at The University of Western Sydney since 1979. His books include a focus on railway construction in 19th century Australia and Asia, including that of the French in China. I was excited to come across your book Transport an Australian History (2010), and noticed your personal collection of tickets illustrate the inside covers. I did an awful lot of travelling by train as a kid. My family comes from Grafton, which is on the north coast region of New South Wales (NSW), which from Sydney was an overnight journey by train. My interest in documenting and capturing events started early, which explains why there are so many tickets. Some of the tickets go back to the 1950s. There are also tram tickets from the 1940s, which belonged to my father. I confess I was also interested in trains as a teenager, this was the late 1960s. My mates and I travelled around NSW and took pictures, documenting the last days of steam traction. Did these early experiences spark your academic interest in transport history? At university I was not much involved transport history until my Honours when I decided to do my research thesis on the area my family came from. I started reading the local Grafton newspaper, The Daily Examiner from the period 1870s to 1890s and found out what everyone was obsessed with… transport issues. The transport issues at that time were shipping services, harbour improvements and the hope that the government would build a railway. Gallons of ink were spent discussing building a railway. This began my academic interest in shipping and railway construction. My PhD was on the French in China. There was very little work done on this, and almost none in English. It was gloriously unfashionable at that time to look at the late 19th, early 20th century imperialism, and especially dull to focus on French engineers and bankers in China! I started my PhD in 1976, the year Mao Zedong died, so the focus was all on the Cold War, and the Cultural Revolution. But I thought it was an interesting topic, partly because of the international relations around China at that time, and the rivalry of the Western powers and Japan. The interesting thing, for someone interested in transport history, was the extent the French Foreign Ministry was obsessed with securing concessions to build railways in China. When reading the archives I found a great deal of interesting things about the financing of the railways and the expectations of what these railways would achieve in foreign policy terms. I’m working on a paper on railway tourism in Australia at the moment, and also mid-way through a project on transport planning in Australia around the time of the Second World War, which had an enormous impact here as elsewhere. I also read for pleasure. I’m engrossed a big biography of Caravaggio by Peter Robb: he was a very naughty young man who travelled because of crime, something Australians can relate too, since that’s the basis of our modern society. I’m also enjoying reading alternately thrillers by Agatha Christie and Raymond Chandler. It’s an Anglo-American adventure and I’m enjoying the different mobility obsessions: Christie’s train timetables and Chandler’s southern Californian autos and boulevards. Is there anything distinctive about an Australian perspective on transport history? Yes. Very little writing on transport history in Australia is national. This is largely because of the organisation of transport. In Australia, railways, roads, ports, etc were built by and maintained by colonial governments, which later became state governments. At Federation in 1901, the Australian constitution vested transport responsibilities in the states. Exceptions are civil aviation which is regulated nationally due to the package of international treaties signed in Paris 1919, and aspects of road transport because of the federal government’s power to levy excise on fuel. The writing of transport history in Australia reflects this state focus, which is different to other federations. As the organisation of transport has influenced the writing of Australian transport history, does it also reflect how we protect transport history? We do not have national museum that looks at transport, apart from the National Maritime Museum in Sydney. However there are state-based museums of varying quality and resources. Queensland probably has the best at Ipswich, although not the finest collection. I love museums but they are difficult things. The antiquarian interest is a wonderful and if I had more space I would be a collector. Thankfully, my collection of transport tickets only occupies a shoe box. But museums need to be more than just the artefacts. They need to tell a story about how artefacts and people have related, and their impact on life and the environment. Museums have to appeal to a wide audience, and therefore compromises often have to be made. I found the exercise of writing labels for museum exhibits a fascinating one – it is very strict with rigid word limits. I really had to be clear about the point I wanted to make. I also tried to do it differently from how it had been done in many Australian transport museums. I focused more on social history, and when I wrote about the technical history, I tried to emphasise how it was not uniquely Australian by showing international linkages and influences. So why should transport history matter? It matters to Australians because we are a country that is so dependent upon people to reach or move around. Virtually all of our history is dependent upon people in one way or another to reach this vast continent or move around within it. Migration is a major theme. Our indigenous populations, the Aboriginals and Torres Strait Islanders both have a maritime past. Then the colonisation of Australia in 1788, which quickly became the world’s classiest gaol, happens quite late in the history of European expansion abroad. From the 1830s most people came here voluntarily. Most came by ship at great personal risk. We have a lot of ship wrecks, especially on the south eastern coast. More recently we have refugees travelling by boat to escape conflict. I wrote about refugees in the Transport book, which I think surprised some people. It is an important aspect about what transport is about, relocation. Are you observing a new generation of students interested in transport history? I wish I could say yes, but I can’t really. The most enthusiastic of my students are interested in transport policy rather than the social side of transport. What about mobility as a concept? I have been trying to push a focus on mobility and tried to get mobility in the title of my book but my publisher wouldn’t agree. They said the public would think it was about people who cannot walk. It will take a while for mobility as a concept, to be part of how Australians see their history and present. That said Australia is an intensely mobile society. Australians travel a lot within their country, and they also travel abroad a lot. Changes in the affordability of international travel have led to this experience of dual identity, with many migrants retaining close relationships with the countries of their ancestors, far more than used to be the case. There is talk of the T2M conference coming to Sydney sometime in the future. Do you think enticing academics to Australia is a challenge? If T2M does come to Australia they can be assured of a very warm welcome and a fascinating time when they get here. I think all former colonies are interesting for their cultural mix. You have the imprint of the imperial power. You have the indigenous life and culture, whose level of state organisation and resilience varies enormously from place to place within the same country. You also have technological adaption from the West into a colonial environment. Colonial and semi-colonial countries are interesting places, and Australia is a fascinating example. But yes, it can be a challenge getting academics to visit. It is a bit like the Irish potato famine in the 1840s: European scholars, like the Irish refugees find it cheaper and faster to travel to America than to come to Australia. The fares are going to be expensive but much less expensive than they would have been before the Second World War. The price for the Qantas flying boat ticket from Sydney to London in 1938 was 100 pounds one-way and took a week. Nowadays it will not take 10 weeks’ salary each way, and it will not take a week to get here, but it is still a long journey. It is however worth doing for the experience. It does inspire awe that we can cross the world in 24 hours.